Rain is rare here in Doha, so when it rains we get excited. We go outside and jump around the puddles. This year we were able to take Skyelar out there too. Gorgeous photos! 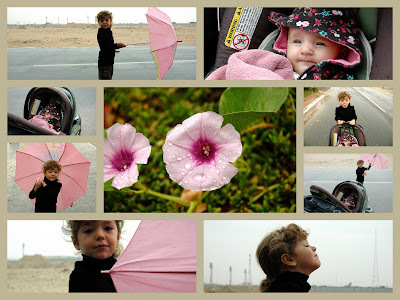 Love the pink umbrella and the expressions! Great set of pictures. Like the boots. I know it hasn't rained in Doha for a long time. Puddles are fun to splash in. Rain! We get a LOT of rain here in Mobile, Alabama. But jumping in puddles and big umbrellas never gets old! Skyelar looks like she's having fun! lovely kaia and skyelar i miss you very much, stay good girls you both, alrigth!